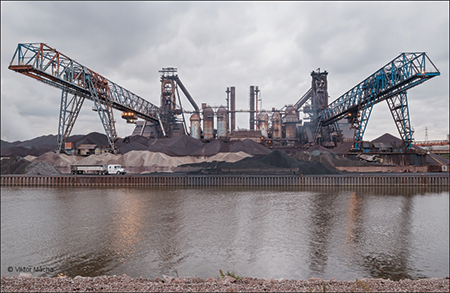 Production at the largest integrated steelmaking facility in North America, ArcelorMittal Indiana Harbor in East Chicago, IN. Photo courtesy of ArcelorMittal, copyright Viktor Macha. As a new age dawns for motor vehicles—think autonomous cars and trucks, all-electric power plants, etc.—the same holds true for their construction materials. At the forefront of efforts to develop, supply and apply these materials is the Steel Market Development Institute (SMDI), a business unit of the American Iron and Steel Institute. SMDI seeks to increase the use of steel through development of innovative materials, applications and value-added solutions for automakers and other users in the construction and packaging markets. SMDI’s recent developments center around third-generation advanced high-strength steel (AHSS). First-generation AHSS, while offering high strength, proved difficult to form, while the second generation, featuring high strength and ductility, suffered from a cost standpoint. Third-generation AHSS seeks to hit the sweet spot of strength, formability and cost effectiveness (see Comparison of AHSS Grades chart). After years of R&D, these grades have hit the market in a big way, according to Dr. Jody Hall, vice president-automotive market for SMDI. SMDI often works one-on-one with automotive OEMs on proprietary projects to help determine ideal vehicle applications. For those who attend the Great Designs in Steel symposium (the 2019 edition scheduled for May 15 in Livonia, MI), presentations sometimes detail success stories resulting from such efforts. Development of third-generation advanced high-strength steels (AHSS) has proceeded with the goal of finding a strength/formability/cost sweet spot among various current offerings. The Trump administration announced in early 2017 that the U.S. Environmental Protection Agency (EPA) and the U.S. Department of Transportation would revise CAFE and accompanying greenhouse-gas emissions standards. More than a year later, in August 2018, the two agencies jointly issued a proposed rule, titled the Safer Affordable Fuel-Efficient Vehicle Rule, that would freeze the standards at their 2020 levels from 2021 to 2026 and revoke California’s Clean Air Act waiver to set stricter standards. Since the rule was announced, EPA conducted sporadic negotiations with the California Air Resources Board in hopes of reaching a compromise that would allow for a uniform set of national standards. On February 20, 2019, the administration officially decided to end negotiations with California over the standards as months of negotiations did not result in any meaningful progress on an agreement, according to administration officials. However, the announcement ensures that California, and the other states that have implemented California’s standards, will engage in a protracted legal battle over the rule once it is finalized. According to the administration’s Regulatory Agenda, the final rule is set to be released this month (April 2019). These discoveries have been applied to third-generation AHSS, reports Hall, and research continues to characterize the new-age materials more thoroughly to eliminate surprises in applications. 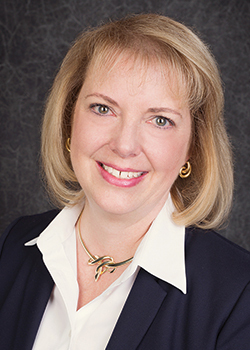 “That means thorough evaluations of stamping, including forming simulation and springback analysis, welding of these materials, effects on tool wear, and more,” she says. One driver for work with third-generation AHSS: hot stamping. Introducing rapid heating and cooling to impart strength and forming capabilities into steel via hot stamping grew out of the limitations of earlier-generation AHSS. The original goal: Replace hot stamping through the application of third-generation AHSS. AHSS sheet finds its way into road vehicles at an increasing rate. Advances have led to commercialization of third-generation AHSS, which cost effectively combines the high strength of first-generation AHSS with the formability of second-generation material. 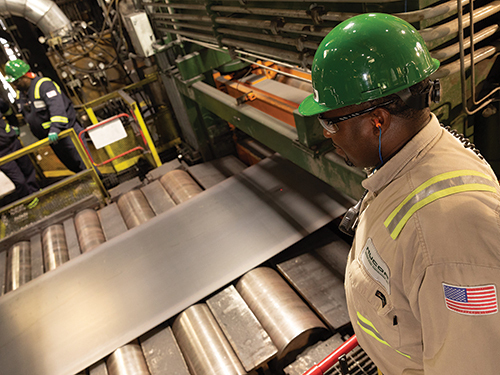 Photo courtesy of Nucor. “But as industry partners developed third-generation AHSS,” says Hall, “the hot-stamping process also improved with respect to part strength and heating-cycle efficiencies. Other R&D has involved coating development to eliminate the need for shotblasting after forming. In recent years, much AHSS R&D, including third-generation initiatives, proceeded with Corporate Average Fuel Economy (CAFE) standards in mind. Today, uncertainty as to coming CAFE requirements has not slowed these efforts, as interested parties prefer to deal with the known requirements, and not bank on any relaxation (see CAFE Standards Update sidebar for the latest developments). Recent CAFE-change proposals have been their own disruptor. AHSS production necessitates unique ingredient mixing and processing, and integrated-steel operations provide the processes and technology to accomplish the task. An early production step involves the use of blast furnaces, such as these at ArcelorMittal Cleveland (Ohio). 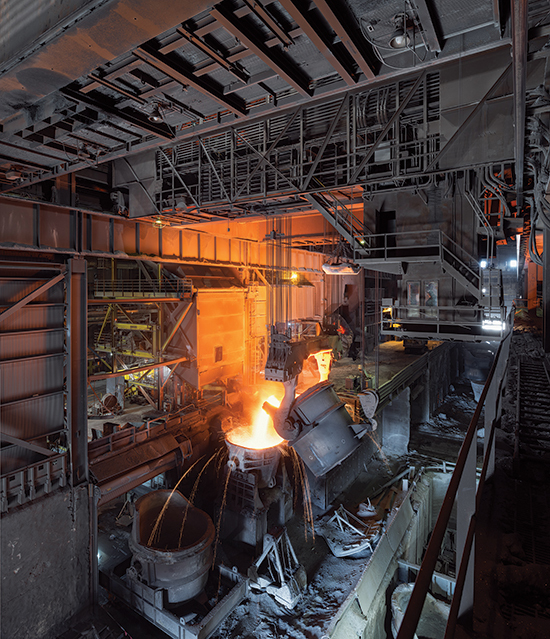 Photo courtesy of ArcelorMittal, copyright Viktor Macha. The acceptance of the original standards have led to rejuvenated efforts by automakers in the past year or so, according to Hall. Whatever standards come its way, SMDI and its partners will continue looking to raise the bar in steel performance and use, and this extends well past material development. Additive manufacturing (AM) represents one such extension as SMDI and its partners focus on stamping dies. “On the tooling side, we’ve been investigating the use of AM to repair stamping dies,” says Hall. “The forging industry, an early adopter, began using AM about 15 years back to repair dies. Back then, adding material only worked for repair of smaller tooling. I remember talking to someone from a company that supplied metal molds for forming tennis-shoe soles. Every year saw a slight change in the pattern of a rubber sole. So this company, with its existing expensive tooling, machined out some pattern details and rebuilt using AM. This saved a ton of money. Expect more AM developments through SMDI’s efforts, Hall offers, along with the continued evolution of latest-generation materials and new vehicle-part applications. These efforts are detailed at www.autosteel.org. In its fifth year as a premier sponsor of the North American International Auto Show (NAIAS), the Steel Market Development Institute (SMDI) provided visitors to 2019’s show a unique look at a future autonomous vehicle. 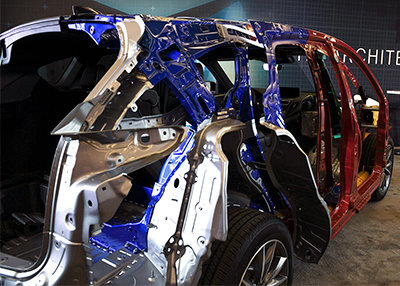 Via a virtual ride, SMDI highlighted the role of advanced high-strength steel (AHSS) in such vehicles. SMDI’s 3-min. virtual journey took participants through a futuristic city landscape as the steel body of an autonomous vehicle was built around them. Riders could explore key components of the vehicle and learn how AHSS used in automotive design can address the potential challenges of autonomous transportation. This cutaway of a 2019 Acura RDX, recently on display at the North American International Auto Show, in Detroit, MI, highlights the evolving use of AHSS in passenger vehicles. It includes a world’s first: an AHSS inner and outer front-door ring system designed to better protect occupants during a frontal or side impact. One unique application for AHSS in the new-mobility area: battery packaging. “Designing with AHSS offers a number of efficiencies over designing with other materials,” says Hall. “AHSS enables smaller section sizes, and smaller sections allow packaging of more batteries. Think of A-pillars and how skinny the pillars are on the sides of windshields, thanks to AHSS. Achieving the same roof-crush and rollover performance with traditional steels would require wider pillar geometry and thicker sheet metal. The same holds true for battery compartments. Less packaging material means more room for batteries. SMDI’s NAIAS exhibit also featured a cutaway of the 2019 Acura RDX (pictured), allowing visitors to compare the AHSS structure of a current vehicle with the autonomous vehicle in SMDI’s virtual-reality experience. The Acura cutaway illustrates a world’s first, an inner and outer front-door ring system designed to better protect occupants during a frontal or side impact. Other AHSS features include a double-ring rear-frame structure to improve torsional rigidity; an Advanced Compatibility Engineering body structure for enhanced occupant protection and crash compatibility in frontal collisions; and an energy-absorbing floating stiffener for enhanced energy absorption during side-collision events.